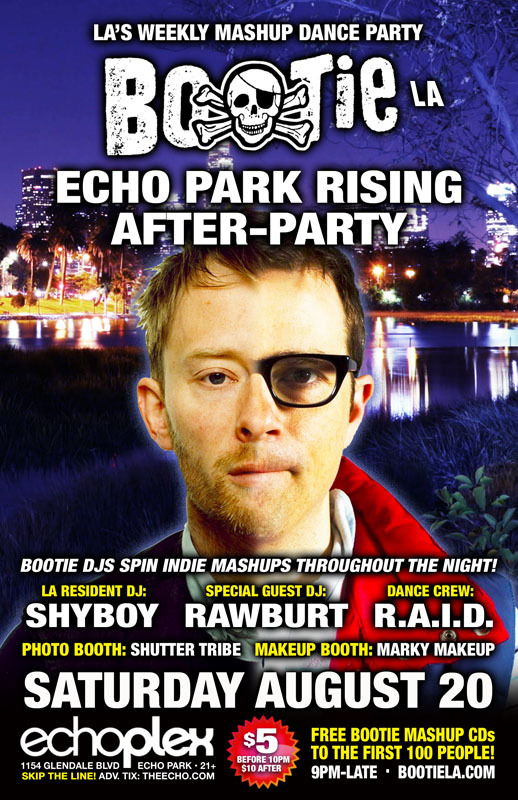 The annual Echo Park Rising festival celebrates the independent music, art, cuisine, and all-around good times of our local Echo Park neighborhood, and Bootie LA is proud to be the official after-party! Join DJs ShyBoy and Rawburt for a special night of indie mashups and more! Only $5 before 10 PM! Celebrating the independent music and art of the neighborhood! Bootie LA has been a part of The Echo and Echoplex since 2005, which is why we’re proud to be an official after-party for Echo Park Rising, a free four-day neighborhood event that focuses on the music, creativity, diversity and small businesses of Echo Park. Of course, the area is known for its independent music scene, so Bootie DJs ShyBoy and Rawburt will all be sprinkling in plenty of indie mashups throughout the night. Resident dance crew R.A.I.D. (Random Acts of Irreverent Dance) will be providing go-go antics all night, while Marky Makeup gives your bodies an indie makeover, and Shutter Tribe captures all the fun! All this, plus FREE Bootie mashup CDs for the first 100 people through the door!